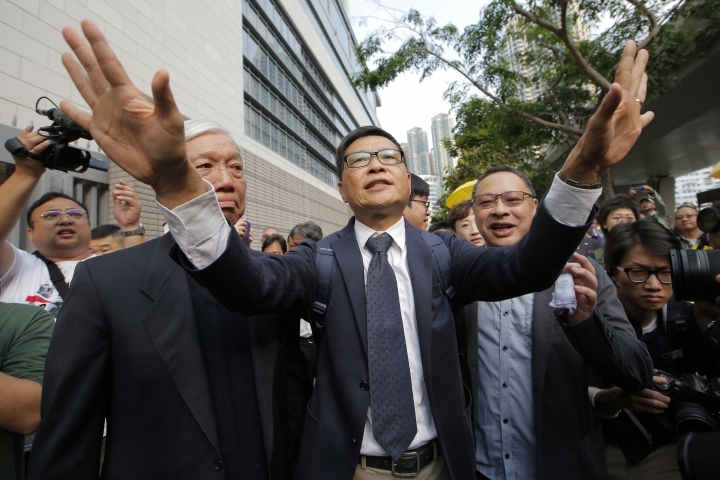 HONG KONG — A Hong Kong court found nine leaders of 2014 pro-democracy demonstrations guilty Tuesday on public nuisance and other charges, in a verdict that activists say likely presages more restrictions on free expression in the semi-autonomous Chinese territory. 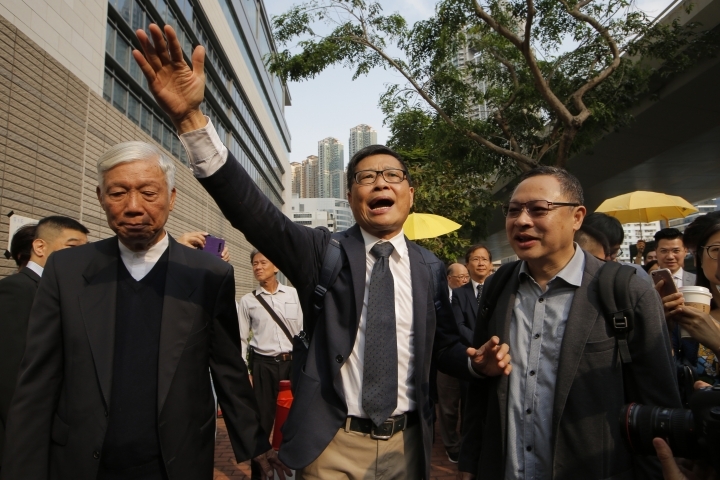 Those convicted included law professor Benny Tai, retired sociology professor Chan Kin-man and pastor Chu Yiu-ming. Two current lawmakers, one former lawmaker, two student leaders and a political activist were also found guilty. 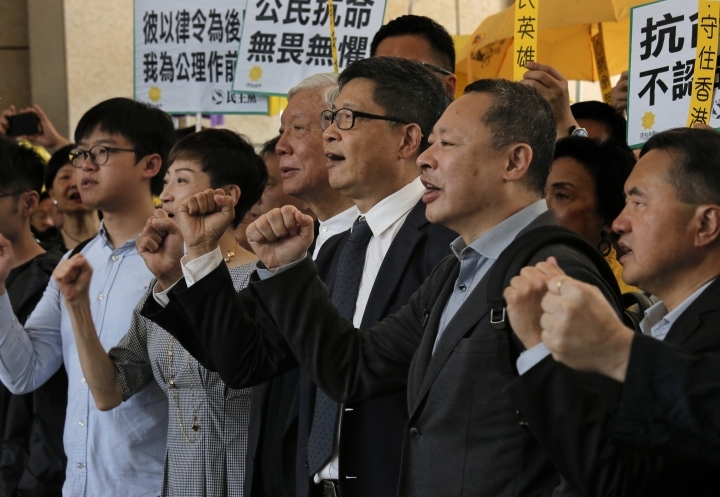 The nine were leaders of the non-violent "Occupy Central" campaign to demand the right of the city's population to choose its own leader rather than merely approve a candidate picked by Beijing. 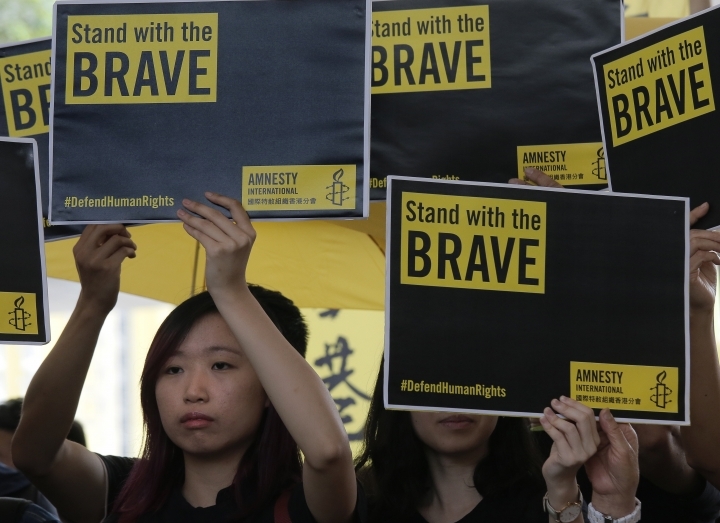 "Hong Kong courts, by labeling peaceful protests in pursuit of rights as public nuisance, are sending a terrible message that will likely embolden the government to prosecute more peaceful activists, further chilling free expression in Hong Kong," Maya Wang, senior China researcher at Human Rights Watch, said in a statement. 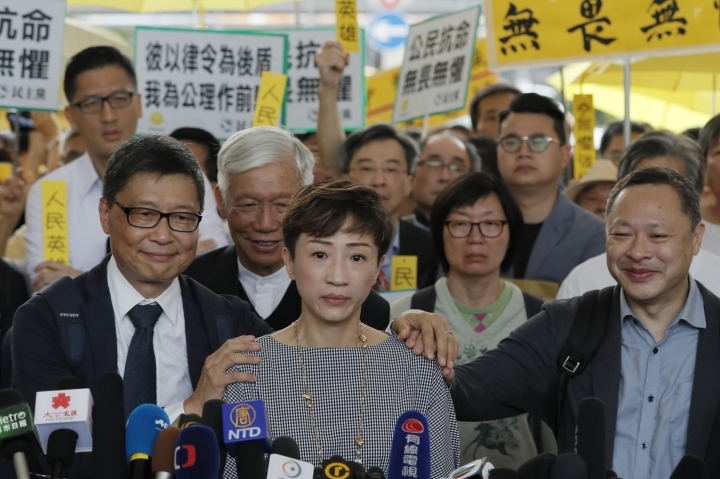 Prior to the verdict's announcement, Chan said he and the others had no regrets for their actions but were chiefly concerned with the movement's legacy. 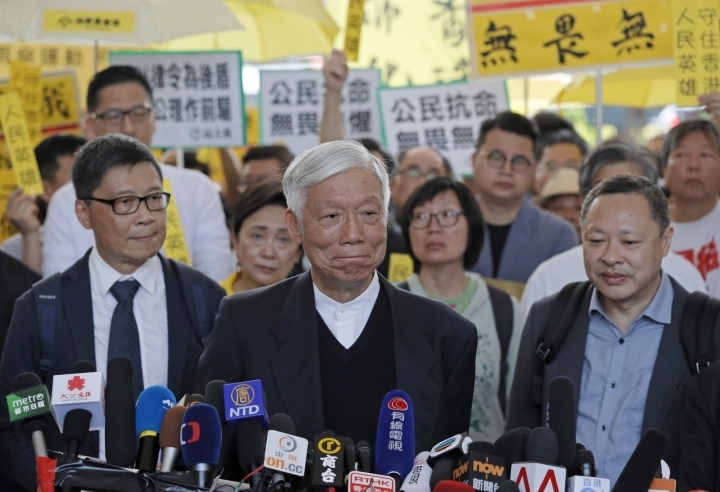 While the verdicts will have an impact on the individuals, "we are more concerned about how this movement will be recognized by the people of Hong Kong," Chan said. Hong Kong's biggest popular protest in recent years, also known as the umbrella movement, laid siege to government headquarters and paralyzed Hong Kong's financial district for 79 days. Thousands staked out encampments on major thoroughfares. Several hundred were arrested. 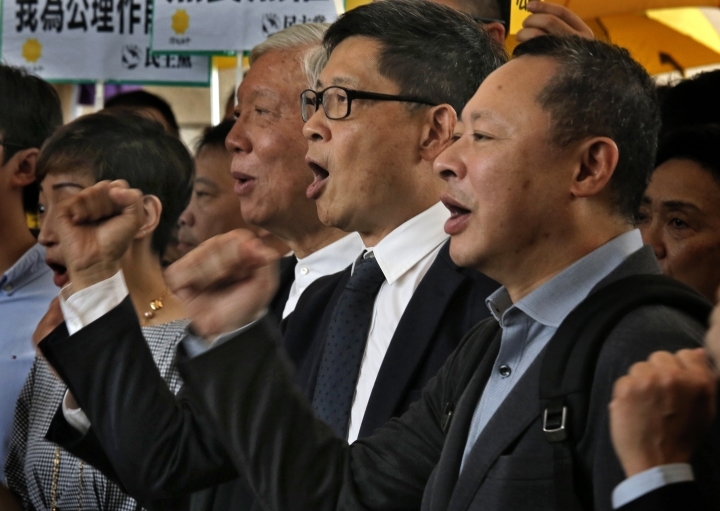 The movement fizzled without winning concessions from the Hong Kong government for free elections and the pro-democracy movement has struggled to retain a high-profile in recent years. 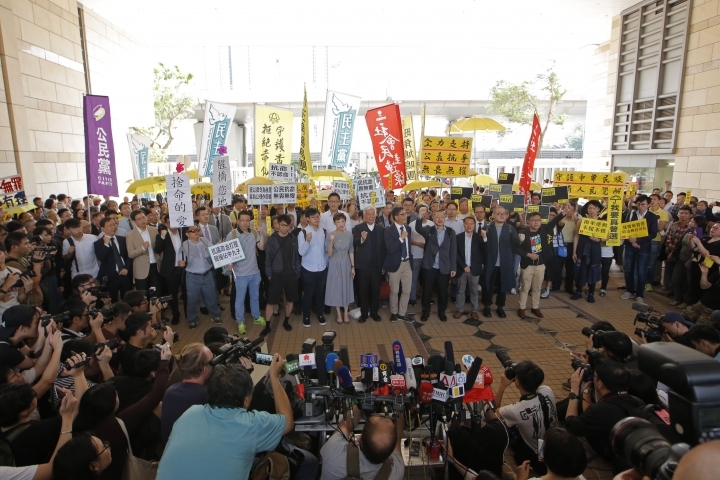 More than 100 supporters, some raising yellow umbrellas that were a symbol of the protests, gathered at the courthouse in the West Kowloon district. Tai said that was a sign the spirit of the protests lived on. 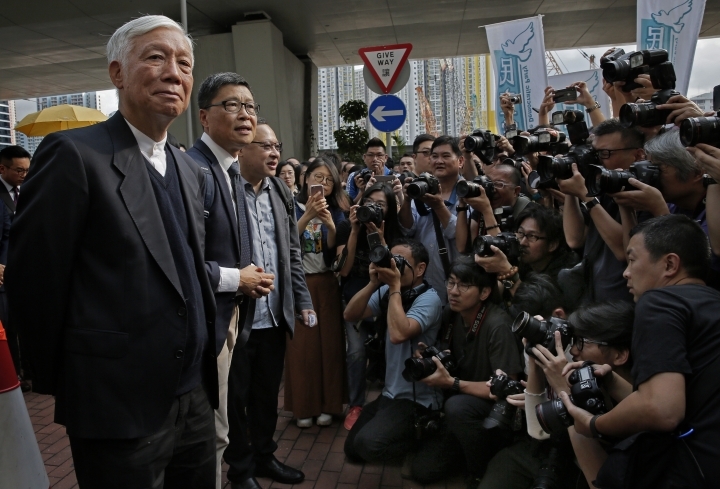 "I have the confidence, many people today, with me together, we will continue to strive for Hong Kong's democracy. And we will persist and we will not give up," Tai said. 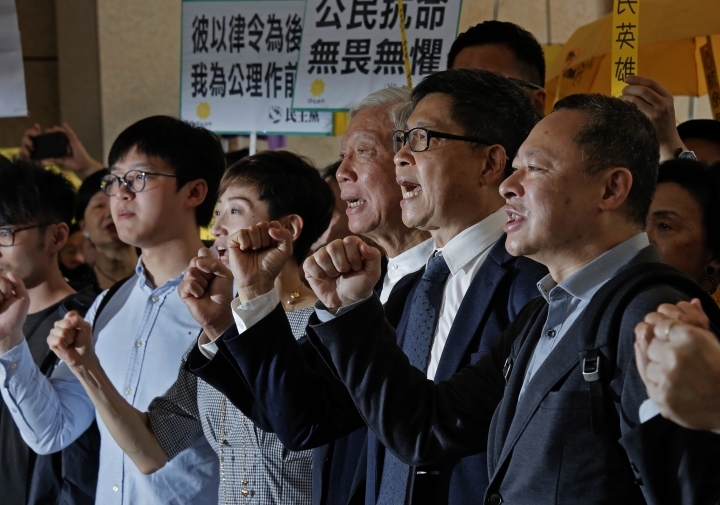 Ranging in age from their 30s to 70s , the nine defendants span generations of Hong Kong citizens who have been agitating for full democracy. Tai, Chan and Chu were found guilty of conspiracy to cause a public nuisance. Tai and Chan were also found guilty of inciting others to cause a public nuisance, while the other six were found guilty of inciting others to cause a public nuisance, as well as inciting people to incite others to cause a public nuisance. Each charge carries a maximum penalty of seven years. The defendants had all pleaded not guilty, calling the prosecutions politically motivated. They are due back in court for sentencing Tuesday afternoon. Three university students prosecuted in 2016 for their leadership roles in the protests received community service. 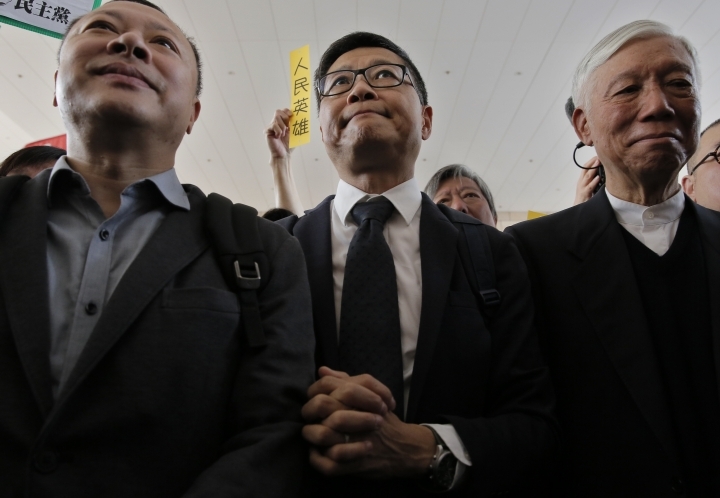 But Hong Kong judges have since faced mounting pressure from Beijing to hand down heavier sentences to deter future protests. Some fear that central government meddling will erode judicial independence, a bedrock value that undergirds the city's standing as a global business capital. The former British colony was handed over to Chinese rule in 1997 under an agreement in which China promised it could retain its own laws, economic system and civil rights for 50 years. 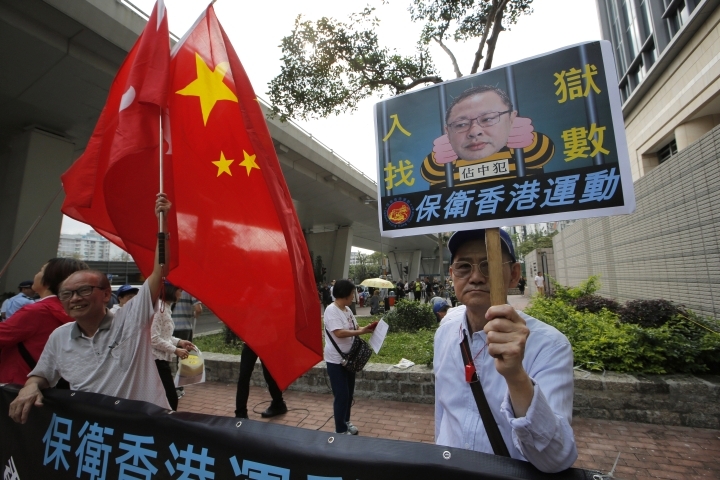 However, China's ruling Communist Party under authoritarian President Xi Jinping appears to be growing impatient with efforts by Hong Kong activists to promote greater democracy. 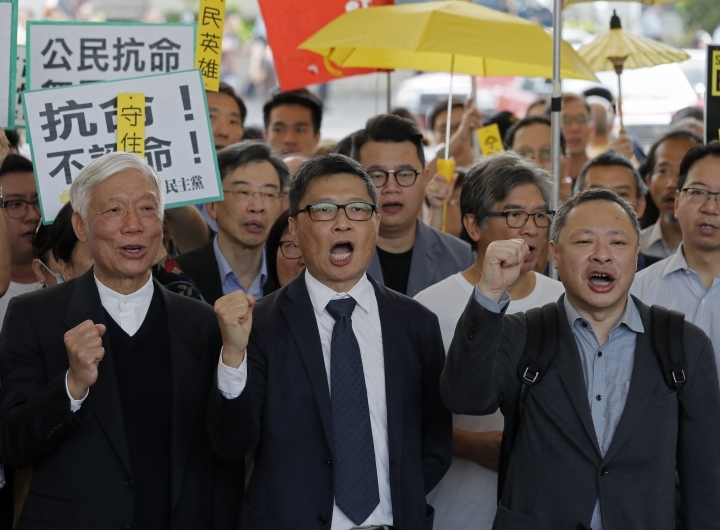 The Hong Kong government last year banned a local political party that advocated the territory's independence from Beijing. 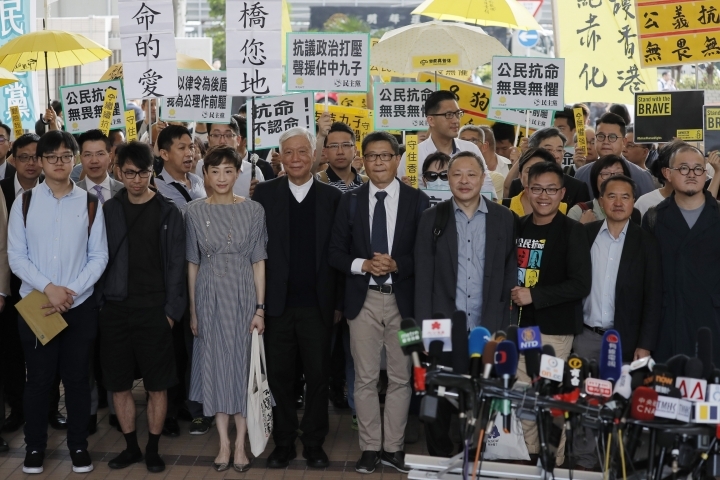 Man-kei Tam, Director of Amnesty International Hong Kong, called the verdicts a "crushing blow for freedom of expression and peaceful protest in Hong Kong." 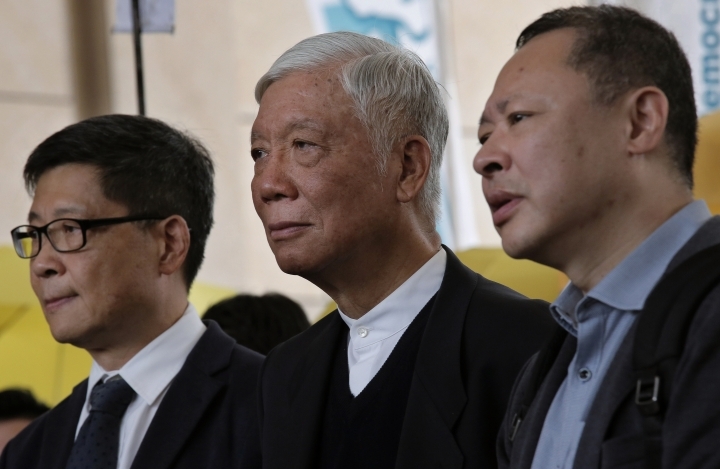 "The government is increasingly using prosecutions as a political tool to target peaceful activists, abusing the law to silence debate about sensitive issues such as Hong Kong democracy and autonomy," Tam said. "We urge the government to cease this chilling assault against people legitimately exercising their right to freedom of expression."